Ben Hur- The Great Christian Epic | J.W. Wartick -"Always Have a Reason"
There was a time when Hollywood battled for which studio could churn out the best epic, the greatest film, the most splendor upon the big screen. “Ben Hur” was a film which towered above all the rest. It won 11 academy awards, a feat matched only by two other movies (“Titanic” and “The Return of the King”), but it was also the only one of those three to win for acting (Best Actor: Charlton Heston as Ben Hur and Hugh Griffith won Best Support Actor). Although best remembered for its famous chariot race scene, the film’s themes continue to echo with our own times. At the heart of “Ben Hur” is a struggle between ways of viewing the world set alongside an epic story which relates that struggle to the cosmic struggle for redemption and salvation of the people of God. There will be SPOILERS for the film in what follows. 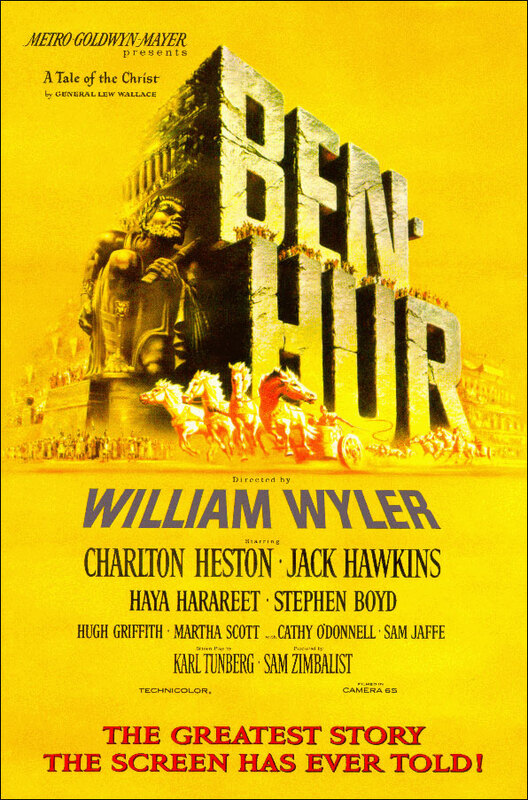 It is important to note that “Ben Hur” is based upon the novel of the same name by Lew Wallace. Wallace, a general during the Civil War, was disturbed by a conversation he had with a prominent skeptic of the time, Robert Ingersoll. Ingersoll’s challenge against the historicity of Christianity gave Wallace a great desire to search the historical acconts around the time of Christ and compose Ben-Hur: A Tale of the Christ , his literary apologetic for Christianity (“Introduction,” Tim LaHaye, cited below). The book is itself a masterpiece and well worth reading. It gives an excellent background for understanding some of the themes of the film. Messala realizes that at the heart of the people’s will is their worldview. Their hope is in the destruction of Rome. They long for a Messiah who will lead them to a successful revolt to throw off the Romans. Yet Messala desires to fight this hope with his own worldview: that of the power of humankind. Rome is power, and for him, the Emperor is that power deified. Vengeance. It’s a theme which seems initially to drive the movie. Messala betrays his friend, Judah Ben Hur, towards the beginning of the film. The Hur family is thrown into prison to languish there, and Judah is sent to the galleys to row as a slave. Judah swears to Messala that he will take revenge upon him upon his return. In a deeply ironic voice, Messala responds, “Return?” The life of a galley slave is not expected to be long. But Judah does return. He rescues the Roman Quintus Arius who is in charge of his ship and is eventually adopted into the Arius family. He returns to Judea as the son of a consul, with all the power and privilege his rank implies. After learning of a way to take revenge upon Messala without the possible legal ramifications–by besting him in the circus maximus in a chariot race and leaving Messala destitute from debt–Judah succeeds in the arena. The climax of the quest for vengeance can be found in the scene in which Judah Ben Hur confronts Messala for the first time since seeming to come back from the dead. He slams his seal–the seal of the Consul QUintus Arius–into a document and stares Messala down. Now, Judah is in the superior position. He is the one whose victory is inevitable. From this point on, his vengeance seems assured. However, after Ben Hur’s epic defeat of Messala in the chariot race, which leaves Messala not only broke but also leaves his body broken, it turns out that revenge is not as sweet as it may seem. Messala informs Judah “the race goes on”–his family is still alive, but they are lepers, left to flounder on the edges of society as unclean, cursed wretches. It is not revenge which pays. It may give some kind of satisfaction for the briefest moment, but Judah learns its satisfaction is only fleeting. His glory must be found elsewhere, and it is not a glory he can bring himself. Judah is devastated by his discovery that his mother and sister are lepers. He realizes there is nothing he can do to save them, and it seems Messala’s own plan has achieved victory after all. Judah, moved by compassion, takes up his mother and sister in his arms despite their protests, almost guaranteeing that he, too, will contract the terrible disease. He and Esther, a servant of his former household, take his family through the streets of Jerusalem. The latest Messiah, Jesus, is set to be crucified, and a crowd gathers there to watch. As Jesus dies, his blood runs through the rainwater as it spreads out symbolically to the world. When it touches the Hur family, they are cleansed of their diseases, washed utterly by the blood of Christ. In a stunning twist, it is not the hero who brings about victory, but rather the Messiah who has only been seen briefly throughout the film at pivotal moments. It is Jesus to whom all glory is given, not to Judah Ben Hur. We have seen that Messala hoped in a human who took upon deity for himself. But the film (and indeed Wallace’s earlier book) show that this hope is misplaced. The God-man that humans should look to is not the conqueror; he is not god because he has human power; instead, the God-man Jesus Christ took on flesh in order to save, to humble himself and become obedient to death on the cross. It is a subversive tale. It is a story of redemption and salvation. It is an idea against which the powers of humanity and the devil muster all their strength to attempt to overthrow, but the idea lives on. It is the idea which cannot be overcome, cannot be outshined. “Ben Hur” is my favorite movie of all time. The epic clearly portrays the truth that is above all truths: we are powerless, but God is powerful. Judah Ben Hur is unable to save that which he loves and must ultimately rely upon another, who saves them through the washing of his blood. Ben Hur’s story is our own in many ways. We continually struggle against the powers of the world and we often have motivations which are, at best, questionable. But ultimately, we find that when we rely upon ourselves, we are unsuccessful. Only when we rely upon God do we find success. Tim LaHaye, “Introduction” in Lew Wallace, Ben-Hur: A Tale of the Christ (Signet Classic Edition: 2003). « Really Recommended Posts 8/23/13- Twain, Egypt, creationism, and more! When I was a field ed seminarian, I admitted to my supervising pastor I’d never seen this. She was so shocked, she gave me the two-VHS tape edition for a graduation! Now, I can only confess it’s been too long since I’ve seen it, and I remember very little, except that I enjoyed it. I will have to add it to the Netflix queue and rewatch! The biblical epic that most had an impact on me was Franco Zefferelli’s “Jesus of Nazareth.” Back when the TV networks still did true miniseries, I watched it over several nights, and was really moved by it. Our denomination had only recently started allowing baptized but unconfirmed children to receive the Lord’s Supper, but you did have to make some statement of readiness to the governing board before you were supposed to. I held off for a long time but, after watching that movie, I felt ready to commune with Jesus in that way. I saw some of it again recently, and was kind of put off by the blue-eyed, lily fair, British-accented Jesus that Robert Powell plays; but I realize the value of that film wasn’t in it itself, but in the Spirit’s use of it at at that time in my life. Anyway, I digress! Thanks for the interesting review and the impetus to rewatch this classic. Thanks for your kind words! I am glad it stirred something in you to reflect back on other memories. It is interesting to see the impact film has on the way we view things. Make sure the Netflix queue you got was not the recent remake but rather the 1959 classic! I haven’t seen the remake but have a strange desire to do so at some point. I’m sure it is no comparison. This, too, is my favorite movie. The full title of the work is “Ben Hur, A Tale of The Christ”. Wallace wrote it specifically as an evangelistic tool. The movie proved to be just that, for me, as I was born again while watching it, and remember vividly the moment the Holy Spirit filled me (during the scene where Christ gave water to Ben Hur). I was just a boy at a matinee in 1960, but remember as though it were yesterday.. I recently purchased a used, classical edition, in good shape from Amazon and have begun reading. Thanks for giving this wonderful work the credit it deserves, Mr. Wartick!